The new small single sided ID card printer PR-C101 combines proven Nisca high print quality and durability standards with low maintenance requirements. Featuring a lightweight construction, the printer can fit into small workspaces. It can even be stored on a shelf or under a counter when not in use. With a simple driver setting change, you can switch the card exit location from the front or back of the printer—whichever orientation best suits your workspace. 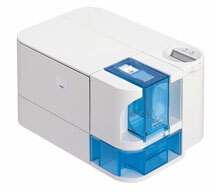 Its industry-first rotating LCD panel provides easy-to-read printer status messages and diagnostic prompts. With its all-in-one removable ribbon cartridge with cleaning roller, the printer requires very little maintenance. This out-of-the box solution is comprised of a YMCKO ribbon, PVC cards, and entry level ID card software. Despite its small size, it still offers security for your jobs, including a security port and microtext capability. For more information, visit www.teamnisca.com.